Add an optional subheading here. 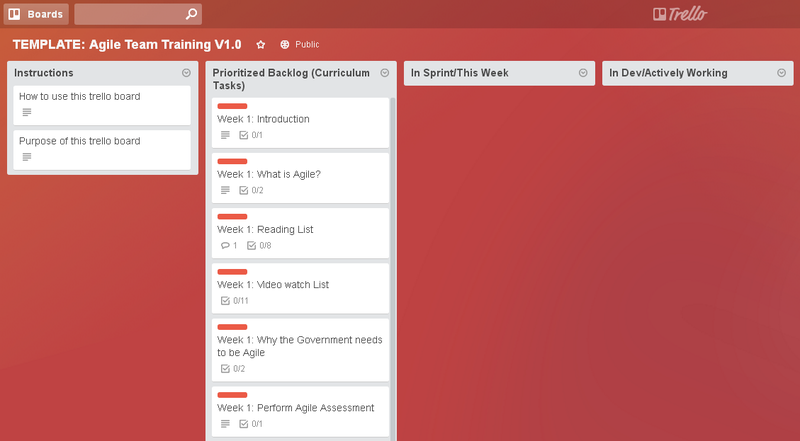 If you’re a Project or Program Manager in government and want to learn the basics of practicing Agile methods with your team, this study track is for you. Our step-by-step curriculum will get your team started. It includes reading materials, videos, industry advice, and workshops to provide the benefits of Agile development to your team and stakeholders. Through three lessons, this introductory course provides a series of weekly tasks to be completed by your team. After tasks are completed, there are workshops for your team to perform that will allow you to test a model of the Agile process on a small scale. This curriculum provides valuable hands-on experience for teams who plan to use Agile methodologies in their projects. This course is intended for a government Project Manager who is responsible for a software project. It is not targeted at executives that have Program Managers reporting to them. Although there are many Agile Methodologies, our course focuses on Scrum – a common and standard Agile practice that is widely used in various industries. As a government professional, you may be responsible for procurement and other issues. Although we discuss these challenges, we’ll focus on Agile project management rather than Agile procurement. We assume that your development team is willing to work in an Agile and iterative fashion, whether they are employees or contractors. There are several options for progressing through each of the course lessons. You can complete the lessons right here on our website, use the PDF document, or use the Agile Storyboard we’ve created in Trello. The storyboard presents the curriculum as a project in itself, helping your team build confidence while learning and practicing Agile methodologies.